The blue color was a tad bit lighter than I expected but overall I like the look of this area rug in my living room. It is easy to vacuum and keep clean so far. The flowers are a soft creamy white which blends in wonderfully. I recommend this rug. Decorate your home with this modern and contemporary area rug. Available in a number of different sizes and colors, this rug is designed with a delicate and beauty floral pattern that will add instant charm to your living space. 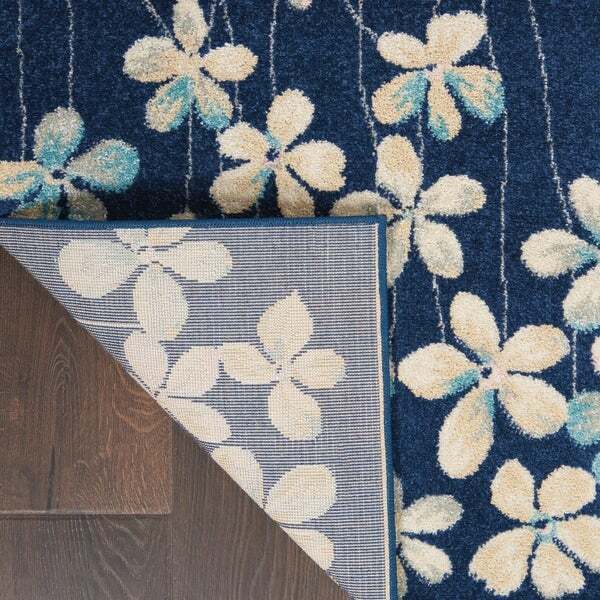 I ordered this rug in the Navy with flowers in a size 8x10. Just showed up today and it came in 5 days which impressed me. It said it shipped from Georgia. It is EXACTLY as pictured. It is thin, but not ridiculously thin. The pile is very soft. It does have a smell but it is a new rug...it simply smells lightly like new carpet. Nothing horrible. The flowers are cream and laced in them are blue, grey, and pink. The flowers accent colors are VERY light and subdued, exactly as the picture shows. I see that it says to not use a beater bar on vacuum so I will update my review after I have vacuumed and walked over it awhile. I'm impressed with it's design and I feel it is well made... especially for the price. It is very beautiful. Beautiful rug! Bought this rug for my daughters bedroom and she loves it! It goes well with her decor. I recommend this rug. Good quality and looks just like the picture. Beautiful rug, color is vibrant and looks great in my living room. Delivered fast and in perfect condition. Would recommend this rug to everyone considering buying it. I love my new rug! It looks even better in person then I had imagined. I was worried the colors of the rug, especially the flowers, wouldn't end up looking like they did on the website but it's perfect. This is a very pretty rug. I wanted something a little different but not crazy. It adds a very cheery look to the room. The pile is soft even though it's not very high. I love it! I purchased this rug in grey and I'm glad that I bought it. It's definitely more of a taupe/grey (true to the photos). Happy with this purchase and may try the ivory out, too! This rug is just as beautiful as the picture shows! We are very pleased. It is not very plush - probably low-medium, but it is quite soft. I have it in my dining room & it looks great.